New truck captures "Top Safety Pick" award. 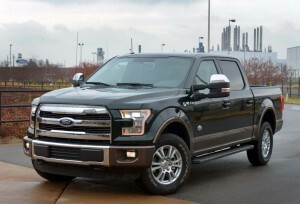 The all-new Ford F-150 has endured criticism for being more costly to repair after a crash: a claim Ford denies. Just a few weeks removed from swatting away criticism from its competition that the new aluminum F-150 takes longer to repair and costs more while doing it, the Insurance Institute for Highway Safety is contradicting the automaker. The safety group crash tested the new F-150 and found that the claims that repairs to the new truck were more costly and took more time to be true; however, the maker’s F-150 Super Crew, which makes up 83% of annual sales, also received the group’s “Top Safety Pick” rating: the only full-size pickup to earn the distinction. While the Dearborn, Michigan-based company was pleased to get earn the safety award, it disagreed with IIHS finding that repair costs were 26% higher for the new model compared with the previous generation pickup. “Ford does not agree with the reparability costs and findings by IIHS and other stunts. Ford’s view is based on real-world accident repair data. In fact, real-world repair costs on the new 2015 Ford F-150 average $869 less than last year’s F-150 model,” the automaker said, citing data from Assured Performance, an independent body shop certification company that works with leading automakers. The automaker also notes that not every organization agrees with IIHS or the charges leveled by Chevrolet, in particular, about the repairs being more expensive. They claim that insurance companies Allstate and State Farm are keeping insurance costs for the new F-150 comparable with 2014 models, implying no change in repair costs in the event of an accident. Ford is gambling big with the move to military-grade aluminum, which was done to cut more than 700 pounds from the truck, improving its fuel economy. Through the first half of the year though, sales of the new truck have been lagging and other makers have been quick to strike seeing a potential opportunity to grab sales from the best-selling pickup. Last month, Chevrolet ran a series of ads mocking the use of aluminum instead of steel in a variety of scenarios. The brand, which sells the second-best selling truck, the Silverado, also made a point of noting that the repair costs may be higher and take longer, thus costing the truck owner more money out of pocket because the truck would unavailable for everyday tasks. This entry was posted on Thursday, July 30th, 2015 at and is filed under Automobiles. You can follow any responses to this entry through the RSS 2.0 feed. Both comments and pings are currently closed. In reality it IS likely that crash damage repairs will ultimately end up being a little higher on the aluminum based F-150 trucks depending on parts cost and what specific areas are damaged and if special repair procedures are required. The reason for this is that aluminum requires different repair techniques than steel and aluminum parts generally cost more than steel. The auto companies make huge profits on replacement parts so Ford can easily sell aluminum parts at the same price as steel parts to keep repair costs in check. I doubt the majority of consumers are looking at crash damage costs when buying a new F-150 truck. They are however to be swayed by the excellent safety rating. BTW the ignorant and deceptive GM TV ad currently running with a guy choosing a steel jail type cell over an aluminum cell to protect him from a wild animal, is disgraceful duping of the clueless consumer, IMO. I find all Chevrolet and GMC ads to be ignorant and deceptive but then I’m not a fan of those products for one primary reason; has anyone besides me noticed, the steering wheel and instruments behind it are offset between one inch and one and one half inch to the right of the center of the drivers torso, chest? This makes it difficult for me to rest my left elbow on the door arm rest and hold the steering wheel. It also makes turning the steering wheel difficult with my left hand. I’ve asked two representatives from GM why this is so and their response, “live with it.” No, I won’t. I’ll drive a ford or Ram instead. Thankfully you have a choice. As I often advise people, voting with your wallet is the best means to send a clear message to sellers. Crash damage costs don’t matter, but insurance does. I guarantee if the F-150 costs more to repair, State Farm et al will figure it out and bump the premiums. Right now they are basing premiums on historical data, but in a year they should have actual costs to analyze. But I expect this will solve itself in the next few years as more makers use aluminum and the repair equipment costs get amortized in the shops. And Ford definitely “taught to the test”, adding reinforcements on the crew cab which the government crash tests, but not the other models.